Some African Americans — mostly men — participated in the political arena long before the Civil War. In fact, in some cities and colonies, both black and white male citizens voted in elections. Despite these instances, African Americans were largely prevented from voting. The pre-Independence period of the United States spans from 1492 to 1763. During this time, powerful, European countries such as Britain, France, Portugal and Spain sought to expand their wealth and world influence by colonizing new lands, including what would become the United States. At the same time, some religious groups (today referred to as “pilgrims”) left their home countries to establish new religious communities. The thoughts of these two groups of people set the stage for America’s founding: power and wealth, and religious freedom for Protestant Christians. Beginning in the 15th century and continuing into the 19th century, over 12 million African people were captured and sold into slavery in Europe and the Americas during the transatlantic slave trade. The United States, having been recently colonized at the beginning of the slave trade, was built on the backs of enslaved Africans. Even after its abolishment in the 19th century, the effects of slavery—violence, oppression, and structural racism—linger on and reverberate throughout the history of the African American community. In Colonial America (through 1776), white, property-owning men established their power and authority. Black slaves — who had been forced to work in the country since its founding and many of whom having fought in the Revolutionary war — were viewed by the dominant white culture as less than citizens (and often as less than human) and were not legally able to vote. This view of African Americans continued through the 20th century and is still perpetuated to preserve and push forward an idea or belief so that it continues indefinitely in many ways today. While Minnesota supported the abolition of slavery in the South during the Civil War, the state did not support African American (men’s) voting rights. The state legislature introduced a bill in 1849 that explicitly limited suffrage to white males. When Bill No. 11 was passed, it had been amended to include males of mixed white and American Indian descent in those granted voting rights, but never had there been any discussion of including African Americans. This, in turn, stripped Black men from the ability to participate in other forms of civic engagement, such as serving on a jury, which required that potential jurors be eligible voters. African American men were once again caught within a structure that refused to recognize their humanity. “Free” men in Minnesota were only free to the extent that they weren’t enslaved—they held little, if any, political or social power. As historian William D. Green describes, “their paradoxical existence was firmly grounded in the very nature of things; they were free, yet never fully free, frozen in a state of civic ambiguity. They would be included in the census as residents but nothing more” (70). 1855 saw the formation of a Minnesota Republican party, after the formation of the national Republican party, which was the first instance of a large political group in the state endorsing the extension of voting rights to African Americans. However, this didn’t mean that Republicans believed in racial equality. Like their national counterparts, their support of abolition and African American suffrage was largely touted as a political and economic strategy. The party’s ideologies were still heavily rooted in white supremacy. By contrast, Minnesota Democrats fought to suppress the Black vote. They defeated measures put forth by the Republican party to include enfranchisement for African Americans on the newly formed Minnesota State Constitution. It wasn’t until after the Civil War that Republicans again took up the suffrage cause. 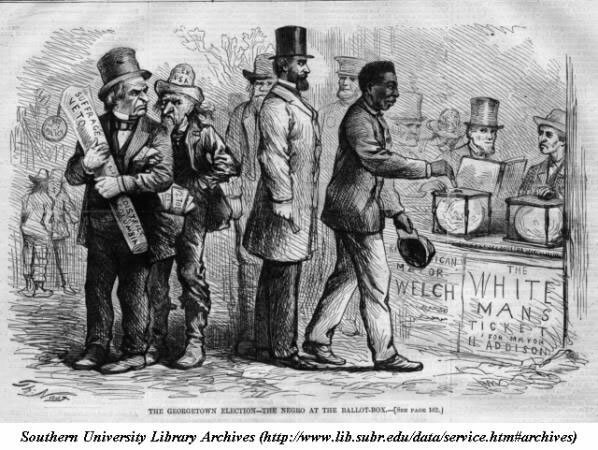 In 1868, a referendum was passed that prohibited disenfranchisement on the basis of race, effectively awarding African American and all non-white men the vote. This took place two years before the ratification of the 15th amendment to the United States Constitution.